This month LOOK Transmigrant Flow as guest curators. Transmigrant Flow is an international curatorial platform for innovative arts events based in Beijing. Kassy Lee (U.S.A.) and Charlotte Smith (Malaysia) seek to transgress boundaries and borders of language, culture, and identity through their events and cultural work. TF: Let's start by talking about your current projects. MP: The biggest one would be the Chinternet Archive and daily posting on WeChat. Am I supposed to talk about what it is? MP: The Chinternet Archive is, at this point, something I've been collecting since April 2014, and it's evolved to probably around 20,000 images. It grows very fast because I collect every day. Anywhere from ten to 100 images a day. I collected for the first eight months before I started posting them as a daily performance because I wanted time to understand what I was looking at, to follow the patterns more thoroughly and to create collections and curate them… ultimately…. 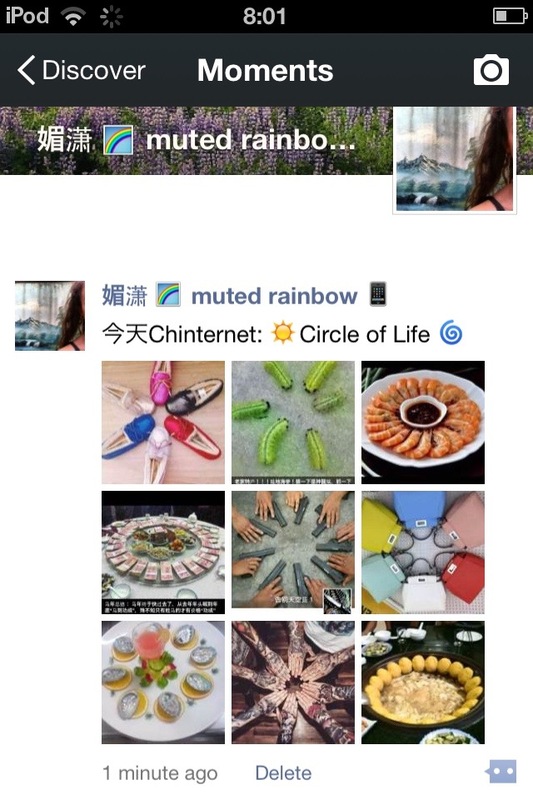 then using the platform I collected them in, which is WeChat, to then display them. So, the audience is just all of the people in my contact list who witness my “Moments” every day. And this means the audience is changing every day depending on who I'm meeting in real life or who's meeting me or being connected to me, adding to this list of ongoing audience members. The collection grows and the audience grows consistently. TF: How did you start this project, the Chinternet Archive? MP: My research partner, Gabriele de Seta who is a digital anthropologist, we started working on it together actually, initially trying to find aesthetic trends in Chinese selfies. So I used the “People Nearby” function in WeChat to start collecting selfies in Beijing specifically. But, in this process of collecting, I was witnessing that there was so much more interesting things happening in graphics and vernacular photography, and also what this meant on a real-life level, like how people were using the app. The user-ship of the app and the particular feature of “People Nearby” are endlessly fascinating. So it just started developing and I couldn't resist because I was finding patterns and trends very quickly so I just kept collecting and collecting and collecting. And at a certain point, no one really knew about it, for like eight months nobody knew that I was doing this and then suddenly I just started posting, because I wanted something to do with it, and I didn’t tell anyone what I was doing when I started posting. I chose specifically not to frame it as art in the beginning. The initial posting was actually to get reactions. To see how people would react to certain things so then I could begin to understand the content better myself. So, initially it began out of digital anthropology research. TF: You mentioned that you used the “people nearby” function, why did you choose to do that not just look through Bing or Baidu? MP: I mean, the reason I chose WeChat as a platform is because it's the place where everything gets funnelled into. If something exists first on Weibo or QQ, it ends up in WeChat eventually. All the relevant stuff does at least. Also, on a technological level, it's a fascinating app to explore because it's China's first homegrown OS and it's the first platform that's been truly international in a way that QQ and Weibo have never, so you're also seeing really what it represents on a globalised scale as a tool. This reflects the direction China's is going in in every part of the world. So that was the reason for choosing WeChat specifically. There are three ways you can reach out to strangers on WeChat. The first is a “Message in a Bottle” feature which is just gimmicky and silly and it's unreliable and it's a very slow process to actually achieve a lot of content. The second is the “Shake” feature which is also unreliable and you can only get one person at a time. The “People Nearby” function allows me to see a whole list of people in a radius of 1,000 meters. So it allows a much easier process to accumulate, collect and see information quickly enough to spend your time wisely in the process of doing so. And the “People Nearby” function is the idea that someone clicking this function is saying, “yes, I'm going to connect to strangers in this moment around me”…. Consenting to the fact that, whether their profile's open or not, they're choosing to reach outside of their limited network within WeChat to connect to strangers. And this itself is quite interesting as a feature because it's separate to what WeChat usually functions as for most of us. TF: You mentioned you think of yourself as an anthropologist or a curator, can you talk about when you're searching for these images and posting them, how do you view yourself in this process? MP: How do I view myself in this process? [laughs] Well I have a photography background originally so, when I really approached it, I was looking at things very aesthetically. The Chinese internet has influenced my aesthetic in a way I never expected. Also, I really love the kitschiness, and the busyness and the obscene nature of aesthetics on the Chinese internet. I found it very enjoyable. It reminds me so much of 8-bit culture or Web 1.0. which I have a silly nostalgia for. So, when I was approaching this aesthetic I was seeing how even selfies and portraiture were being represented in the home in the same way that you see the kitschiness of Chinese internet and those details, I love looking at those details in the background and what they reveal on a sociological and psychological level. And, not necessarily why people are posting, but how they're choosing to post themselves, to me, is quite interesting. I see my role as a sort of documentary photographer for this reason. You can imagine the Chinese internet as a landscape, which it is, it is a physical plane in the virtual world. I'm walking down this virtual street of the Chinese internet and I'm photographing, literally, through screen shots most of the time, what I witness happening around me. The virtual world in China is not separate from the real world. It is one world together existing with any person who has a mobile device in hand. So, to me, I guess my role is, I'm sort of a documentarian photographer, maybe, something like this. TF: You said that you've worked across many mediums in your career as an artist, could you talk more about which mediums you're drawn to in the moment and maybe some of your background in other mediums? MP: Yeah. Well it all started with writing actually. I've been writing poetry since I was four years old. And then it evolved into photography. Which is what I eventually majored in, but I quickly evolved into video and film. And so I experimented in independent films for a short while. And then it evolved into sound and music. And then it evolved into performance. And so it's interesting because all of these mediums, what they have in common, is that they are based in intuitiveness and a quick response. Like if you think about poetry it's a very quick response to something. The same with photography, you're quickly collecting something. In sound…. I produce music and sound very improvisationally, so it's all based off intuition with the musicians I work with or with an experience I'm having with performance, also exactly the same. So most of my processes are based off a real reflective response to what is happening around me or what I personally experience on many different cultural levels, like trans-cultural experiences because I've grown up and lived in many different places. TF: Let's talk some more about this idea of trans-culture or cross-culture in the WeChat archive that you're building. MP: Well the biggest thing is, how I collect is through a location based feature, right? So to describe what the Chinese internet is, it's like location, location, location. So it is like this physical/non-physical realm of space. But because of the internet history in China, and how it's evolved very quickly to the mobile device and many people's first experience of the internet is through mobile devices, it's also been something very transient which is a different history to most of us in the West. In the West we began with large expensive computers which you had access to if you were of a certain demographic. Internet was slow, you had to wait for it and it was expensive. This is a very different culture from developing countries, for example China and it's own internet history. So this mobility is really a reflection of the direction everything is going in terms of globalisation, mobility. The ability to cross borders, physical borders, virtual borders, whatever. This feature is also location based because anyone using it is somehow connected to China, whether they're Chinese, or it's their family, or their friends, or business, or something. So everything that's being processed and filtered within it has a relationship to China and therefore to the Chinese internet. It was also developed and is managed by a Chinese internet company. But it’s mobility on cellular devices allows it to physically cross the GFW. So, for example, when I was in Korea, Seoul, I can turn on my “People Nearby” function, which I did, and I collected people in my vicinity. I was looking at what Chinese people in Korea were doing. What images were they posting? And in the images they're posting, what does it tell me about their demographic, their jobs, their age, their families, where they're living and what they're doing in Korea. So the “People Nearby” function lets me collect this little slice of a Chinese person's experience in Korea and allows me to sort of explore that. And I can do this in any country I go to. Some cities, obviously, I can find more content than others. Bigger cities like New York, Houston, cities with large populations of Chinese people, you're going to find more content. Smaller cities around the world, sometimes I don't find anything. But in each of these locations, it extends the idea of how the whole world is globalising and how everything is becoming mobile somehow, and how China's a part of this in it’s own history, in a way it has never been before… like in the way China's expanding through the globe through industry, through culture, through education, through whatever. TF: I saw you were interviewed by WIRED Germany, was the interview in German? TF: You also mentioned you were interviewed by Casimir TV from South Africa, so why do you think there's such a global interest in your work? MP: Well I think it's two things. I think everyone's interested in technology and the internet, and right now everyone's putting their eyes on China. I mean, the fact that what I do is both, is like a whole new level. And the fact that there aren't many other people who are talking about it or in the same way that I am at this point in history. Although, that will eventually change. But in general, images are powerful. They are something we can all interpret in some regard, whether or not we're Chinese or speak Chinese. We all connect to images on some level. So, I think it's a combination of those, maybe. TF: You've mentioned you have an interest in psychology, could you talk about how psychology influences your work? MP: Absolutely! Especially behavioural psychology. I mean, I did study psychology briefly so I do have a history with it. I mean, I'm just fascinated with people, actually. And I'm really fascinated with how they connect with each other… maybe because I grew up my early youth in Saudi Arabia as an American and left because of a war, then going to a country I had never lived in that didn't understand me….kids made fun of me…those were my earliest memories of America…total feelings of displacement from an early age. And so I've always been an observer from the outside. I've always felt like an observer from the outside so, when you're in this position, you tend to watch a lot. And you watch behavioural patterns. And the longer you do this, the more you pick up on why it is people do, and represent themselves the way that they do. And then eventually, I did this for a long time looking at online cultures and participating in online experiences and performances. So all of this applies to what I'm doing now, which is watching behaviour on a platform like WeChat, seeing how people are using it, talking to my Chinese friends about what some of it means, the stuff that I can't interpret myself. Which then opens me up and allows me to feel much closer to China. It also allows me to see on what level trans-cultural experiences are universal. Certain things like posting pictures of your baby, you know, to making selfies. These really basic things. So, the psychological angle, as far as interpreting images and why I choose to collect certain patterns, is based off of details in those images. The objects in the background are much more revealing to me than the people in the images most of the time. 'Cause the people in the images are shaping themselves the way that they want to be seen in some regard but those objects are just the objects. They are what they are and they tell a lot more. TF: At the beginning you mentioned that you were collecting these images for eight months before posting but now it's become quite important to you to post in real time so how did they change for you and why? MP: The posting in real time is really only based on when I'm in specific cities I'm posting about. For instance, when I was in Hong Kong, and Shenzhen, and Korea, or Xi’an, or Shanghai, or any of these places I was posting in real time because it's location based and I was trying to reflect that I was in that location and most people in my contacts knew I was traveling at that point. But day to day, I'm not really posting in real time. The content is coming from the archive which has existed now since April 2014. So, it'll be two years in a couple of months actually. But some days I do post in real-time, even in Beijing, it just depends on the content I find that day. I often reflect on what is happening in the real world too… smog, weather, disasters, news… etc. Other postings are based off of content I’ve been collecting over a long, long period of time and finally feel are ready to share publicly. TF: Do you get many posts of comments from the photos and the archive and have you had any particularly interesting responses? MP: I had one guy who really wanted to impose Orientalism on me, saying I was making fun of China because in the beginning I was actually writing a lot in Chinese and English as poetic gesture to reflect on the content and that was my artistic touch. And he interpreted it as me making fun of China which, it's not about me making fun of China, it's me reflecting on China. Those are two different things in my opinion. That was the only hostile response I've ever gotten. It was funny because he was not a part of any of my other friend networks and nobody else was witnessing it because, you know, when someone comments on your “Moments,” the only people who can see it are those who have a mutual friend. So it was funny because nobody saw this except he and I.
TF: Were you responding to him as well? MP: Absolutely. And in the end he finally sort of understood what it was I was doing in a way. That's the thing, I don't tell people what it is, if they become my contact they're just automatically part of the audience whether or not they like it. They could choose to not look at my “Moments” but most of the time they want to. They look forward to seeing it every day in some regards and, what was interesting was that after the first month, people I started to see in real life were constantly making more comments to me in real life than on the posts, saying, holy crap I love this Chinternet stuff, it's so interesting, it's so hilarious, oh my god, the stuff in Korea was fascinating. So actually I get more responses in real life as a result than I do with people responding with hearts or short comments. TF: Do you think that's because they are viewing your account as an art exhibition? MP: I think most people think it's just like a blog or something. I think that's what most people interpret it as, which I think is hilarious because for me it seems like a reflection of the whole experience of broadcasting online. It's like everyone says, if you're broadcasting so constantly with some sort of continuity then it must be a blog. The fact that people in my network are not all artists also, they don't necessarily interpret it as an artistic gesture. But I like this because my biggest issue, actually, with art is the Art World and how inaccessible it really becomes to people outside of it…and their inability to be able to reflect on what's being made. This gesture, this constant daily posting performatively allows me to directly address and create an experience outside of a market, outside of a gallery, outside of anything else. As a foreigner in this landscape, it's a precarious situation because I work with Chinese content and produce Chinese things that are thoughtfully reflective of this and the Chinese aesthetic, but I'm not Chinese. So the Chinese market is not interested because I'm not Chinese. And the Western market is not interested because I'm not Chinese. But it doesn't mean that what I'm doing isn't viable to a larger discourse. However nobody knows how to write something like that into this history yet. So, I've written myself into it by creating this circumstance where artists, curators, everyday people, business people, anyone who's in my contacts, has to experience it. TF: You mentioned the “People Nearby” function on WeChat and that it's something that people use to reach out into the open and welcome a connection to somebody else and that when you actually connect with them and see their profile that the reason behind what they want to do that is often revealed. Can you give some examples? MP: Yeah. I often have people, obviously married men, contacting me. So when I originally started my account, when I was exploring this, I was not myself, I was a Chinese woman. A very beautiful Chinese woman, actually. So people who were connecting to me were men mostly. Sometimes women in the beginning. So this was over 2014, April, a year and a half ago. TF: Did you have a profile? MP: At that time I didn't. I'd created a false profile of images as well. So I, essentially, was constructing a Chinese girl's life. In the beginning, and I did this to sort of assimilate myself into an environment where I didn't stand out and I could see what was happening on a natural level, like, how people were connecting or choosing to connect to certain kinds of people. So I created this avatar initially for this reason and what I found really quickly was, as a beautiful Chinese girl, men contacted me a lot. Married men, clearly married men. So that motive itself is pretty obvious. Men with pictures of them and their wives, I mean, why are they contacting a beautiful, young random Chinese girl? We all know what that means. And then, at that time, the only women... I was trying to connect to women and talk to women, because in the beginning I was actually interacting with people, but there is a limitation to what you can achieve in interacting with strangers and I found it wasn't really conducive to the approach of what I wanted to achieve, which was an archive at a certain point. So I was trying to connect with women and no one would ever talk to me except retail women and, in the beginning, there were very few of them and I would say…. just since the beginning of this year, since January 2015, ten times the amount of retailers exist in WeChat and contact me on a regular basis to try to sell me things. Because they can't tell if I'm Chinese or not at this point because I have a very ambiguous profile and it's a closed account. But it says, I love music, I love rainbows, haha… in Chinese so to anybody, I look like a Chinese person still, so I still get many, many comments from women only through this way usually. They are usually trying to either sell me products – beauty products, clothes, watches, shoes – or to get me to come to their beauty clinic… like nurses who are clearly trying to get you to come to their beauty clinic to have procedures done. These are common people that contact me. So you see a business culture happening, you see a hook up culture happening and you see normal things like people just connecting for friendships. I've actually connected to random people and we have started a friendship through this feature. TF: Regarding the location function, you mentioned that because WeChat is linked in some way to China, whether it's people who've lived here or Chinese people living around the world, friends, family, are there any locations in the world you're particularly interested in traveling to based on that? MP: Absolutely! Africa! I would love to spend a good amount of time in different regions of Africa where industrialisation is occurring. Where China has its hand in it. Also in places like Spain and France and California where you have high populations of Chinese people or Canada too, and then even more obscure places like South America. Certain regions of South America where there's Chinese industry happening, like Brazil. In parts of Southeast Asia, Vietnam, where Chinese factories are being built. Essentially in these high-density areas experiencing an influx of Chinese people. For example, Spain is experiencing this. Also Portugal because they are having very slowed economies so property is very cheap and if a Chinese person buys property in these regions they can ensure their children access to European schools very easily. Or even citizenship for themselves. This happens in Canada, this happens in California and they can go and have their babies there and their babies have citizenship. So I'm very fascinated with those kind of areas. But Africa the most. TF: So you've been talking about real life and the virtual space, what do you think of that divide, in your work or in your ideas? MP: For me, they used to be a lot more distinct than they are now. They're something that, once you live abroad, actually everything becomes virtual or starts to feel virtual. Because the people you have the closest relationships with do not live in your physical space any more. So you extend that relationship through virtual mediums. The longer you do that, the more natural this becomes. And then of course, in China, we all function on WeChat in a way that's almost surreal a lot of the time. Real discussions, real relationships being built and growing through these platforms that, at this point, what my feeling is, they are becoming synonymous and I think this is happening very naturally and very quickly in developing countries that are experiencing the mobile experience of the internet first. Where there's no disconnection, the internet is everywhere and it's cheap, it's accessible. So it becomes an extension of your body. And to me it's just a reflection of how much closer we are to it being in our body. Which is only a matter of time. TF: So the internet's inside of us? MP: Yeah, just never logging off. Literally. TF: Could you talk about that a little bit for people who might not know what you're talking about? MP: I mean body hacking has been going on for sometime now. The first cyborg is this British/Catalan guy, Neil Harbisson. The UK was the first country to acknowledge him as a cyborg on his passport. He has a light-sensor that allows him to experience colour through sound and he's created a whole cyborg foundation. And then if you look at robotics and the evolution of prosthetics and even in Japan they're testing being able to play pianos using your mind. All of these are becoming really real in our lifetime and they're going to continue to grow and grow. Which means our relationship to technology is becoming more physical on a literal level, where it's in our body or connected directly to our body and, therefore, on an emotional, psychological level that reality means that disconnecting is only getting harder and harder. And then when you're never disconnecting how can you maintain a clearness of your own self-awareness. Things like that. MP: I always joke, but I think it's pretty spot on…. but I see WeChat being like Web 3.0. It's like Web1.0 was a certain level of graphics and Web 2.0 was social networking like facebook, myspace, online shopping, all of this kind of stuff and I think that Web 3.0 is the centralisation of all of these things in this history…because at this point WeChat is reaching a global scale in user-ship, not entirely yet but that's only a matter of time and it's entirely encompassing. Everything from WePay, to business deals, to calls, and face calls, and chat groups, moments, so it's like a combination of tumblr, twitter, social networking, Taobao. I mean you can buy things and you can have virtual secretaries and virtual boyfriends and it's like entirely encompassing like you described. This is the next phase of the internet. It's mobility especially. TF: I used to get those apps like WeChat Secretary to do everything for me because I don't speak Chinese. Do you have any thoughts about that? MP: I only recently heard about WeChat Secretary but I don't particularly need to use those things. Yeah, I think it's just an extension of connectivity in a whole new way. We've seen even in the West, in America, people outsourcing like their IKEA furniture to Craigslist. This is just an even more efficient way maybe. TF: It's taking the labour out of doing things. MP: Yeah. And it's creating whole new industries that we've never envisioned before. And that's a thing that always has to be understood in the development of technology, there's always this fear that technology's going to overtake human jobs but it's not that. It's a shift of economics, it's a shift of industry that emerges. So it's not about it destroying things for humans, it's about humans adapting to the evolution of industries and what that means. And in this case, think about it, something like WeChat Secretary is basically outsourcing ayis or whoever, people who need work. People who need new opportunities, people who need jobs. There's something quite positive about it. Especially applied to a country of so many people who are moving more and more to a cities and in need of work. TF: What would you say is the goal of your work? MP: It's actually moving me away from the arts and more into the sciences, like psychology and neuroscience. It's opened me up to an awareness of what our emotional and physical relationships really are, like what I always describe as the physicality of the internet. Which ultimately is a few things. To me when I say this, I'm meaning the internet is as physical as our ability to access it, right? But also our emotional relationship to it. The entanglement, and anxiety, and excitement, and fear, and anger, and how we use it to dehumanise or we use it to avoid things that we are scared of, like breaking up with people in WeChat or ending relationships with people by whatever other platform. So witnessing WeChat in it’s evolution for the last year or two is directing me into this feeling of... I want to produce things that have much bigger impact. Making objects that are put on walls to sell, I don't really feel like I'm contributing to a larger impact, to the direction humanity is going in. Creating an archive that can be accessible to other researchers and then posting every day in a way where real people are experiencing it that allows them to understand what they're witnessing in a new light….to me this is a much bigger impact. And it's more empowering, not just for me but, for my connection to the world and what I have to contribute. TF: I feel like I almost forget to ask this question because we all live in China, but outside of China people always talk about Chinese internet being blocked or regulated or that kind of stuff? Does that effect your work at all? MP: I mean that's what drew me to this side of the world initially, because I grew up in Saudi Arabia which, next to North Korea [DPRK], is one of the most intensely censored countries in the world. So I think I've always been attracted to places with limitations and, since I was working in new media and internet based art and galleries and projects back in the States for years before I came here, I was already fascinated by what was happening on the internet. And then first I came to China in 2004, to mainland China, I'd been to Hong Kong many times before as a child, and I knew something interesting was happening since then. So the thought of the Chinese internet for me was like a whole new internet landscape to explore and I wanted to understand this better because I can closely relate to what it means to be censored in many real ways. And when you grow up with this level of censorship, you can never go back. You can't like suddenly say, oh I'm not being censored in the world. Actually you spend the whole of your life self-censoring, understanding that people are constantly watching, observing, collecting etc. So it plays a factor in me trying to understand another landscape's version, but I find the limitations can be very profound too. It creates a level of subversity that can be innovative, and to me that's what's so fascinating about the Chinese internet….the innovation that is a result of what shouldn't or what can't be shown and how you have to work around that in creative ways. TF: This idea of being constantly watched, haven't you then become a watcher as well? And now you are not so much creating your own art to be displayed, but capturing other people's photographs to be displayed, does that reflect on you somehow? MP: Yeah, I think I am very comfortable being an observer. I mean that's a natural state for me because I've always somehow been a foreigner since the day I was born. I mean I am making works out of the archive as well, there are physical pieces that are being made as well. But yeah, I think it absolutely all feeds itself. It's an extension of itself. It's like me, I have always viewed what I am (since I've lived between certain levels of cultures) as existing in a mode of thinking that's always in the in-between. So what that allows me to do is adapt to foreign experiences very quickly and connect in deep ways regardless of the limitations. And it allows me to see beneath the stereotypes to process it in a way that I can then help relate it to other people of other cultures. So it's almost like transcultural interpretations. And that's because I've always existed between some sort of in-between where I'm shifting constantly and this is a condition of what the third culture individual lifestyle results in. This is becoming more and more common especially here in China where you look at interracial couples, international families coming and doing business here, or even Chinese families going abroad and living and raising their children in entirely different cultures and then coming back to China. We're reaching a point where more and more people are going to have to deal with the reality of the in-between and how do we deal with it. Michelle Lee Proksell 媚潇 (b. Dhahran, Saudi Arabia, 1985) - Michelle is an independent researcher, curator, artist, musician, photographer and writer currently based in Beijing, China. The majority of her research and curatorial practice is published under an archive she started, documenting and interviewing emerging digital and post-internet artists in China at www.netize.net. As an artist, she works with video, sound, performance and her ongoing Chinternet Archive - a collection of vernacular digital artifacts from the Chinese Web. She is most interested in the physicality of the Internet and its relationship to human behavior, emotions and social interactions.